Four years ago a rubbery-kneed, nervous version of me set off from Paia Youth Center on Maui for the 3 mile “Fun Race” inspired and lead by Suzie Cooney of Suzie Trains Maui. The day was windy as we all headed toward the water, most of us experiencing our first open ocean down winder. Led by safety crews on jet skis we all made our way toward Kanaha Beach Park – my husband, Ed, and I were on bulky, rented, dinged up 11′ surfboards. Little did we know know what a metamorphosis would occur in those 3 miles. The moment my feet touched the sand I wanted to go back, begin again, and do another run. Yup, hooked! We had connected with Naish team rider, Suzie Cooney, before the event and she had started what would become a series of training insights, motivational energy and a dedication to making sure we would be ready for the adventures we wanted – a try at the full Olukai Ho’olaule’a in 2013. Best of all, we were introduced to the world of top quality equipment. You just don’t arrive on an island (or any vacation or event venue) and hope luck will connect you with the best. Inspired by the entire Naish culture from founder Robby Naish down to the technical and service team at Naish Maui Pro Center we began to research the right boards for open ocean down wind events. Since 2013 we have been fortunate to reserve (yes, plan ahead) Naish Glides for both the Olukai Ho’olaule’a and the Naish Columbia Gorge Paddle Challenge. We love to train every warm winter or spring day in Oregon on our Naish ONEs (inflatable one design board). For non-one design events we like to try various 12’6″ and 14 race board designs from naish. 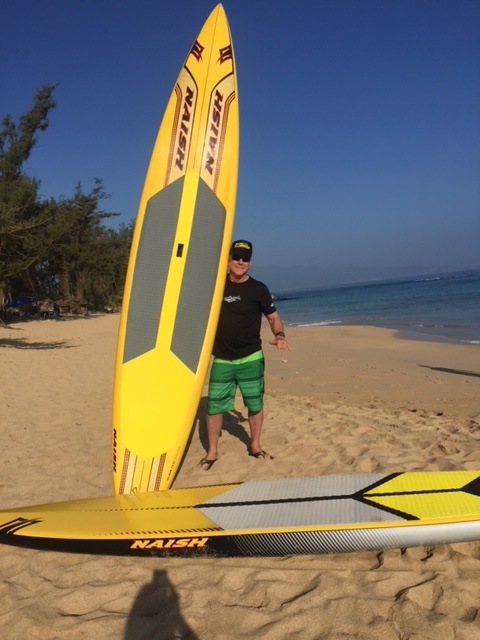 For this year’s Olukai I have the Naish Glide GX, a 29 1/4 wide board that is 14 feet of zooming rocket. Holy cow! The fun run was incredible. The day before I even surfed a waist high swell and scored a strong cut left with this forgiving and agile race board. I never, ever, thought that as I tiptoed the final 4 weeks before my 66th birthday that I would discover so much stoke and fun. When you have the right, top-quality, equipment whatever your skill level is ramped up several notches. The fun was wrapped in the many stories from people of diverse experience and even more diverse home towns. I write this story to encourage you to paddle outside your comfort “envelope.” It is not about where you finish. 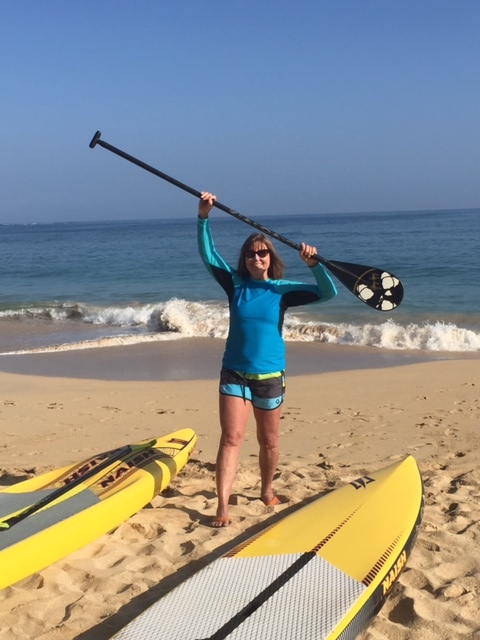 These events are about connecting with an ‘ohana that is as passionate about paddling as you are – even if this is your first event or a new sort of challenge. The morning started with a safety message from Olukai’s legendary waterman, Archie Kalepa. He advised us all to be sure we had a “buddy” who would watch and be with us until we finished. I looked around as we all located our buddy and noticed the youngest paddlers, aged 6 and 7, in a giant bear hug. “YES! We will watch out for each other,” they exclaimed! Is that not exactly the spirit of support and team that we hope to inspire in the youngest generation? 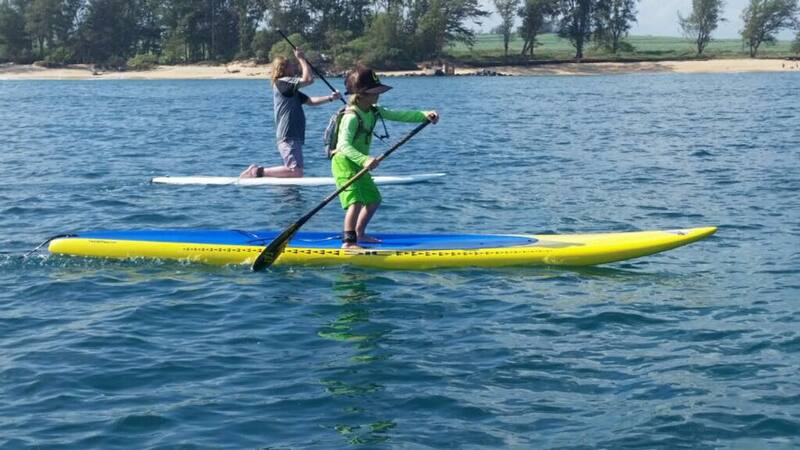 One of the two young paddlers is Marley, age 6, who lives on Maui. He paddled 3 long, hot miles during our OluKai practice paddle. He was supported all the way by Suzie’s safety sweep team and his parents. He rips on waves and is a skateboarding machine. One paddle stroke at a time he is honing his determination and attitude. We had a few paddlers from Sweden who not only paddled the 3 miles down wind, they jumped back in the water after the finish and kept on paddling for more fun. 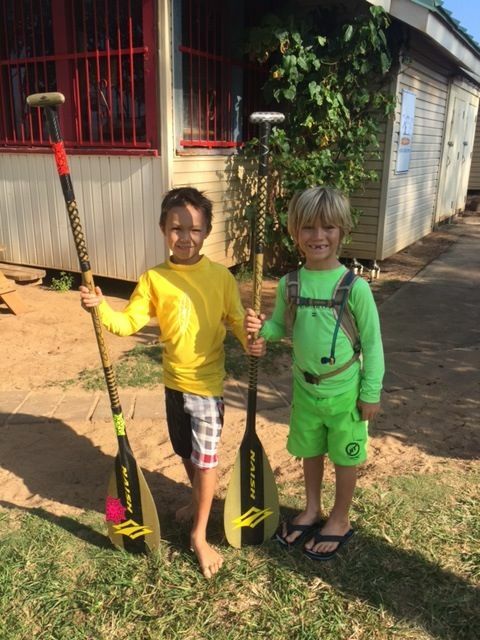 A couple of friends from Massachusetts with vast experience in a variety of race formats gained the confidence to try the full Olukai Ho’olaule’a next week. Some athletes had huge experience but were trying out more narrow race boards – we all exchanged stories and laughs. Who won – all of us! Join us and Suzie Cooney for an exciting morning at the Demo Day Friday May 1st , under the OluKai VIP tent. This is one day before the race. Meet the pros and listen and learn about some of their training tips, experience paddling Maliko and lots more! Right after, join Suzie in a fun and informative, hands on training session where she will demonstrate and talk about specific training tips to get you well prepared. We wouldn’t miss it!